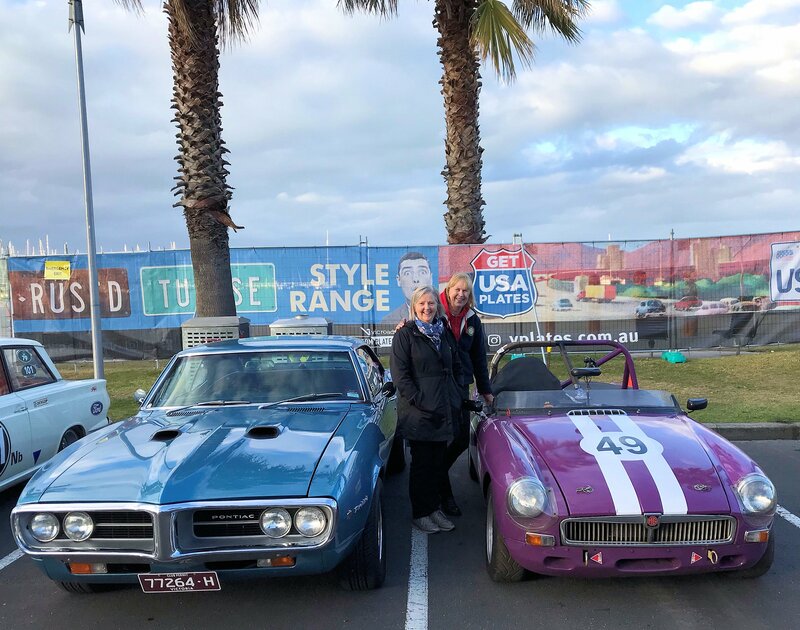 What could possibly go wrong driving fifty-year-old sports cars around a curved, quarter-mile course at the picturesque Geelong beachfront on a fine November weekend? Quite a lot it seems ! Early on the Sunday a rare Daytona Coupe rearranged its front-end styling trying to bulldoze water-filled safety barriers at the end of the 300-metre braking area, unfortunately this iconic classic took no further part in the event, save for being left in staging area as a reminder to drivers to take care when braking from warp speed at the end of the sprint. Of course, some cars and motorbikes are faster than others and braking efficiency varies with age and different makes and models. Graeme Hollingsworth’s E-type Jaguar has excellent brakes, much better than those originally fitted in the 1960s and they are capable of locking all four wheels in an emergency stop from around 100mph. How do we know? We know because Graeme’s throttle stuck open when he came off the loud pedal crossing the finishing line during his third run on Sunday. 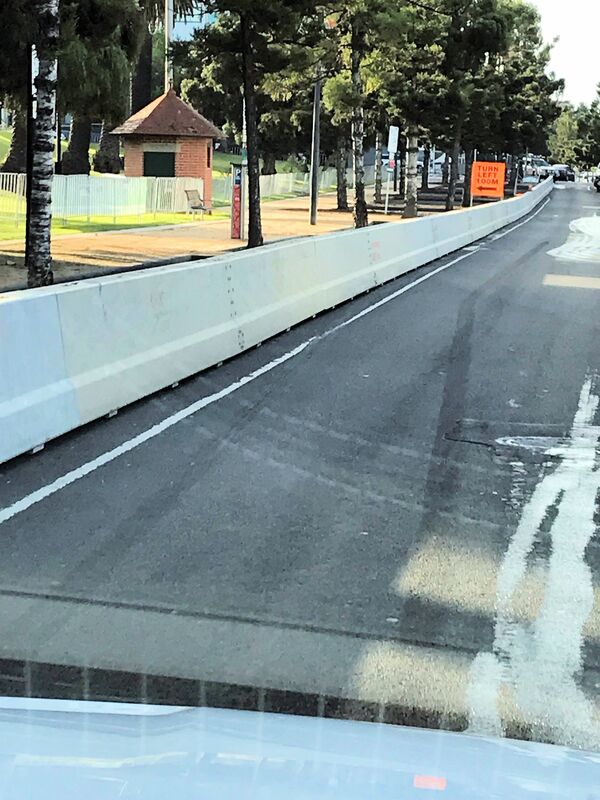 As he jumped on the brakes and threw in the clutch, the brakes locked, slewing the car towards the barriers lining the left side of the track where the front, near-side tyre took a glancing blow bouncing the car’s trajectory towards more barriers on the other side of the track. Flicking the accelerator pedal with a toe freed the throttle, and now with most of the speed washed off, the Jag was bought under control and driven gingerly into the return assembly area. Expecting to see crumpled panels and damaged suspension, Graeme was relieved to find the damage was restricted to massively flat-spotted tyres and a tiny scuff mark on the front wheel and wheel-arch. He also recorded his second fastest time on that run, but sensibly decided not to push his luck with a fourth run. Earlier in the day Graeme pushed the Jag to a 14.9 second pass – he was content to have bettered his times from last year as well as breaking into the fourteens. 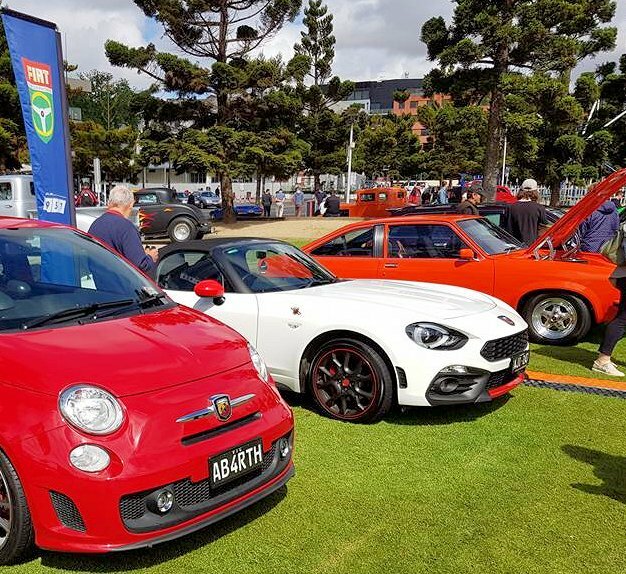 We had four Sporting Register members competing at the Geelong Revival this year, as well as Mike Whitford who supported the Fiat Car Club’s display by showing his 124 Abarth Spider. 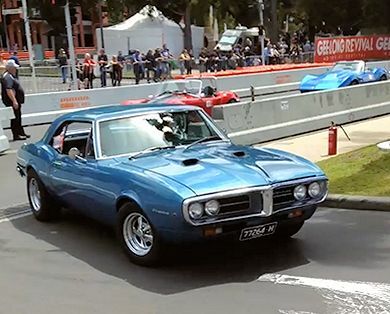 David Anderson decided to give his MGs a break whilst testing his Pontiac Firebird out over the quarter-mile; he achieved a very respectable time of 15.1 seconds on two of his four runs. The 350ci V8 drives through an automatic transmission which Dave tried in both manual and automatic modes, although it seemed to make precious little difference to the results. 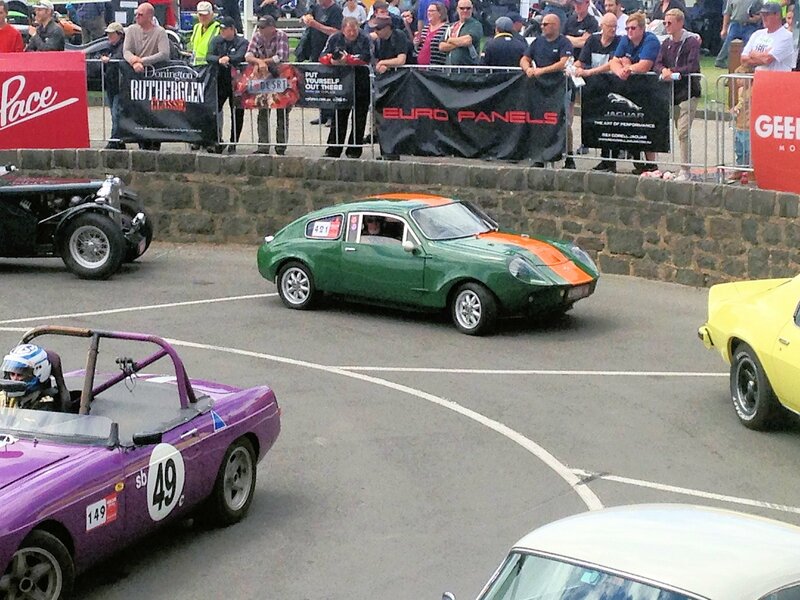 Upholding the honour of MGs, Jane Vollebregt entered her hillclimb and circuit-racing MGB at this year’s event. Jane began with a 15.5 second run then followed that up with three runs all in the 15.2 second bracket. Very creditable times that would have placed Jane well in contention for the Fastest Lady trophy if there had been one to contest. 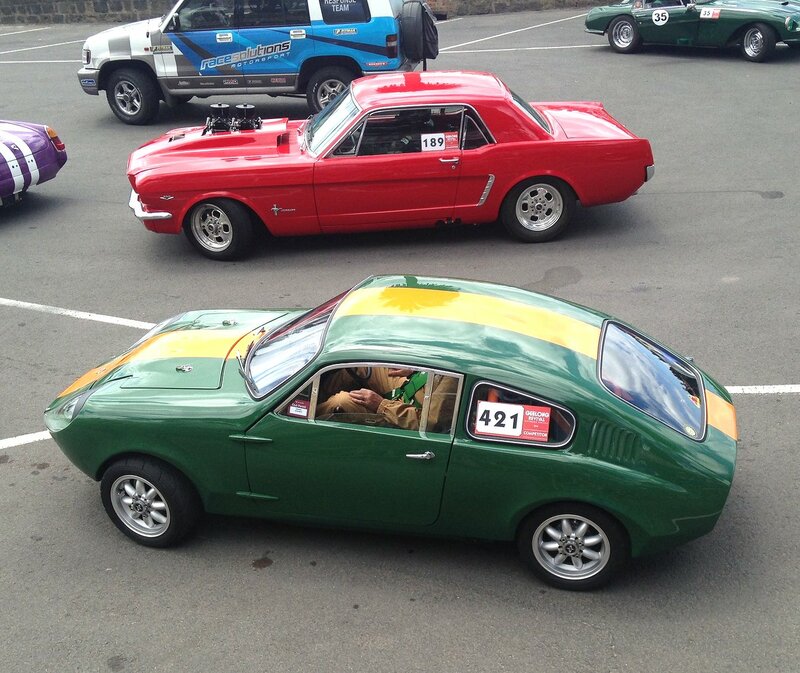 Steve Schmidt’s Mini Marcos was participating in its fourth consecutive Geelong Revival event. A quarter-mile sprint is perhaps not the Marcos’s forte, but it is one event where being unable to turn your head due to the fact that your helmet is jammed against the roof lining, is not too problematic. The little Marcos matched its times from previous years with a best of 15.7 seconds. There is much more to the Revival than just the sprints, it truly is an all-encompassing motoring festival with car and bike displays, trade shows, a Friday night tour, free skid-pan rides with professional race drivers, great food and even a fashion parade. If you missed it this year, pencil it in your diary for 2019.